Founder/CEO @Gumroad. Writer of fiction, painter @shlpaints. See also Reflecting on My Failure to Build a Billion-Dollar Company on Medium. Sahil Lavingia started his career at 14-years old building forums and logos on sitepoint and flippa. He didn't care about freedom, purpose, or relationships. He cared about making a billion dollars. 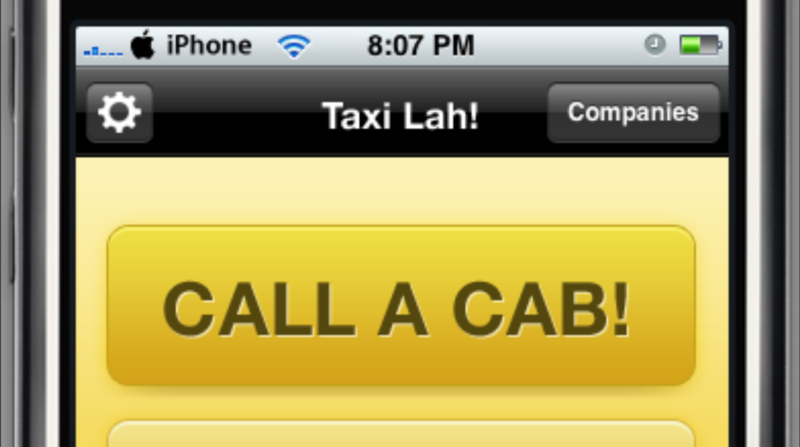 In 2010, Lavingia started building his first solo projects: an iPhone app in called Taxi Lah!, and another app called Dayta. Pinterest found him from these iPhone projects and asked him to help them build an iPhone app. He ended up owning 0.57% of the company. 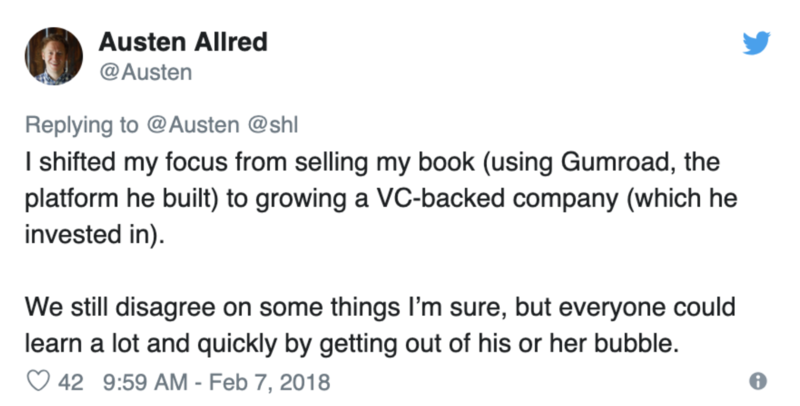 Sahil Lavingia optimistically tweeted that Gumroad was going to be a billion-dollar business, in preparation for a future New York Times article. Lavingia had an idea for his "first billion-dollar company" - a platform to easily sell content. He raised a $1.1M seed round, and later raised over $8M. It was surprisingly easy to raise that money in the valley if you fit a pattern investors are looking for. If you can't raise money, it's likely because you've failed to build something interesting, not that you're bad at raising money. 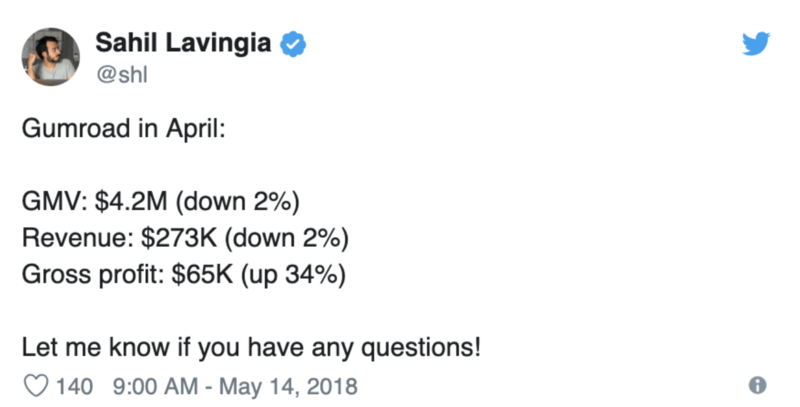 Every month of less than 20% growth (which is on pace for ~9 growth per year, which is what investors are looking for) should have been a red flag. 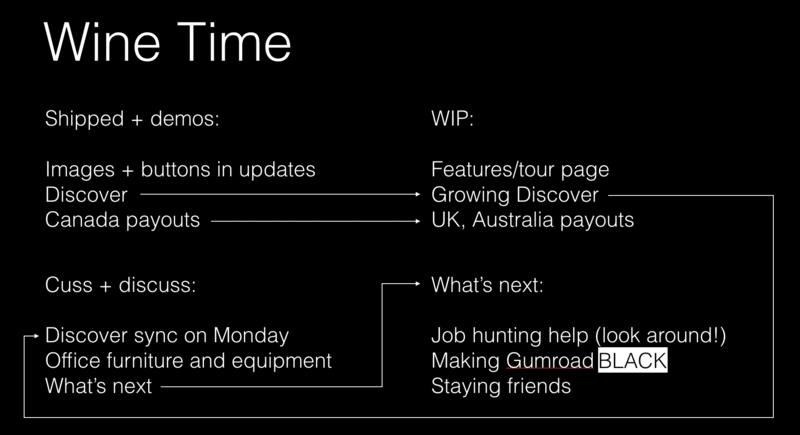 Contrasted with Pinterest, which was doubling every 6 months, Gumroad wasn't performing as well as Lavingia wanted. These features were nice, and some gave a substantial boost (like 10% growth with the "pay with paypal" button), but it wasn't enough. Lavingia felt like this incremental growth didn't really matter, because it wasn't growing his company fast enough. He felt like his market was putting a rate limit on his growth. Sahil Lavingia's slide telling his company they were laying off 75% of his company, including his best friend. Inadquate growth meant it was much harder raising a series B funding round. Lack of funds meant Lavingia's only option was to lay off employees. The first piece of publicity Gumroad didn't want, announcing their layoffs. 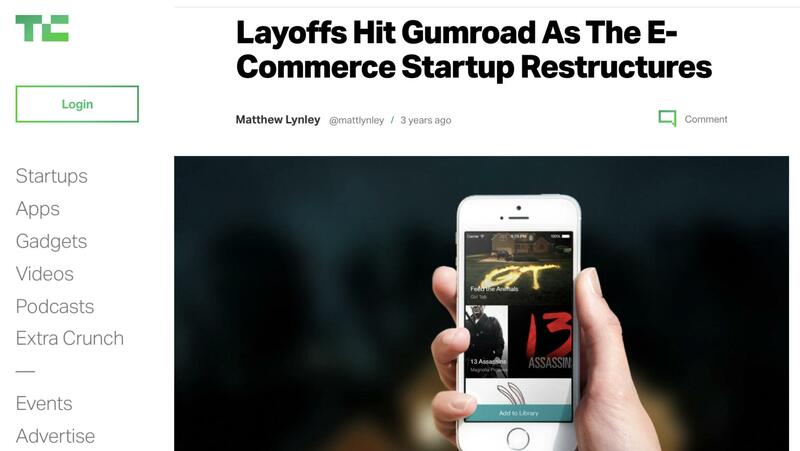 Firing 15 people in 2015 was enough to make Gumroad profitable. Sahil Lavingia felt like the community in Silicon Valley was judging him for his business failures. He moved to "the whitest place I've ever been," Provo, Utah, and noticed the cultural change immediately. Instead of "what do you do," the first question people asked in Provo was "where are you from?" All the while, Gumroad continued to profitably grow. 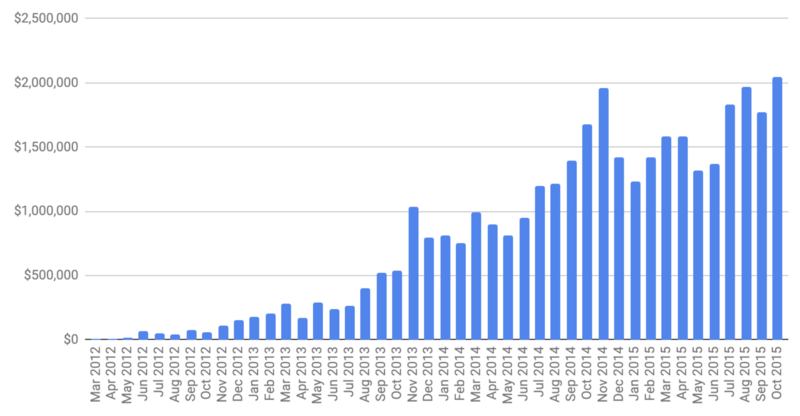 Gumroad continued to grow processing volume profitably through 2018 after the 2015 layoffs. In November of 2017, Lavingia received a call from an investor offering to write off their investment: "I am following up our conversation a few months ago. KP would like to sell our ownership back to Gumroad for $1. Can we discuss this week?" Overnight, $16.5M in investments turned into $2.5M. 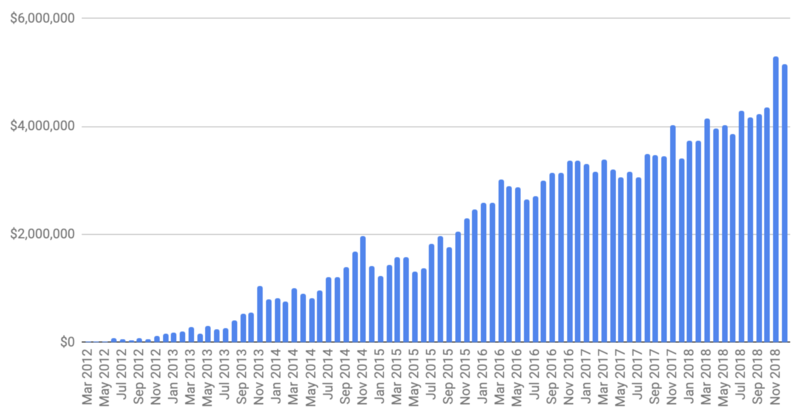 Shifting Gumroad into a profitable company not hyper-focused on growth meant he could be proud of what he was building again. 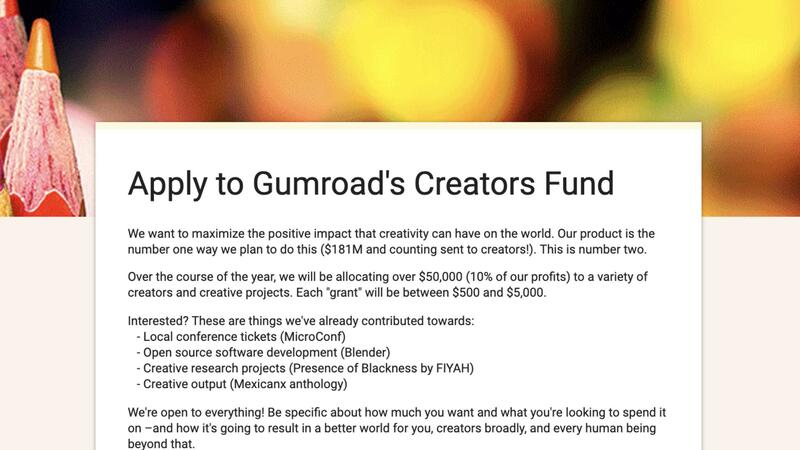 Gumroad has been the platform that many creators use to raise enough funds to bootstrap themselves. Lavingia was able to shift his focus to more creative projects he enjoyed, like the Gumroad Creator's fund. For years, his only metric of success was building a billion-dollar company. He now believes that was a terrible goal. Enough is a decision, not an amount. Sahil Lavingia has made the choice to have enough, so he's successful. How much of your success today do you attribute to your VC investment money? We could not have build what we built without the $7M that we raised. It was market distorting, like a Wal Mart moving into a small city. I don't have an answer for you, but the market distortion from venture capital is definitely a problem. Do you think the market could support you being a billion-dollar company in 10 years? I dunno - maybe! I have a post drafted called "Reflecting on Reflecting on my Failure to Build a Billion Dollar Company."